Posted in: Monthly Updates, Weekly Post. Tagged: checking, house, hsa, net worth, positive, savings, surgery. GUYS!!! We are finally Net Worth positive! God is good! 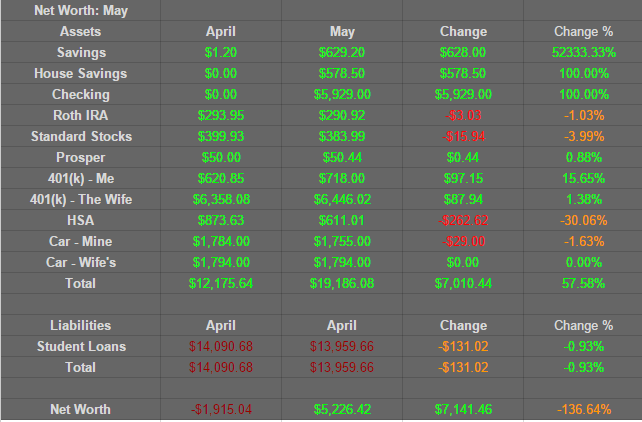 When I first started tracking our Net Worth in June of 2013, we were at -$28,255.15. It took us a long time, but we have finally made it! On top of that, we are now living off last months income. We did kinda cheat… Since my wife got paid 3 times last month, we used the lowest check to help us out in May. Also, I get paid on the 15th and 30th of each month. But since we were living paycheck to paycheck, I would take the check on the 30th and use it for the next month to get us to my check on the 15th. This means that my check on the 30th of April was moved into May on top my checks for the 15th and 30th of May. It was as if I got paid three times also! So we used one of my checks in May. Savings: Due to extra paychecks, we were able to put $600+ back into savings. House Savings: New category! Time to start saving for a house. We are going to be putting most of our extra money into here. I haven’t figured it out exactly but I think 75% will go into here and then the other 25% will be split into savings and extra payments toward student loans. Checking: Another new category. This will basically be what we earned in that month and what we will be living off of for the next month. Prosper: Got my first repayment on one of my Proper loans! Can’t wait to see that grow. HSA: This account is going to get drained soon… I’m having ACL surgery and already the bills are starting to come in.